Yup. That’s my Kimchi a-brewing. I’m having a fermented item fit since last year and was inspired by David Lebovitz’s shot at Kimchi making. I’m not really a heavy Kimchi eater. Not a big fan of those bottled varieties available in the supermarket. However, a Singaporean family friend, Uncle Raymond, has proven to me the lengths of making ‘aptly’ spiced Kimchi. Years ago, he gave us bottles upon bottles of Kimchi to eat at home. He made it with his wife, Auntie Potin, and it was awesome! It didn’t stink like the others. It had that nice clean smell that you can taste in the Singaporean Sweet Chilli Crab. I assume that he used the locally ground chili to make it. More so, his veggies were really crisp! So I took a shot at it. Varying the Lebovitz recipe for a bit adding sugar in the process. And for lack of chili, I also used shichimi (a Japanese 7-spice chili of sorts) and Malaysian dried chilis. I also dripped my cabbage and didn’t let it soak in brine. Now, it’s in day 2 of fermenting and by the weekend, it should be fine. I realized that fermenting locally is a lot faster than in France. lol. That was stupid, it just made me more aware of the difference in temperatures around the world. Like, according to Lebovitz, it took him 3 days for his kimchi to bubble, while mine took overnight for it to bubble. It’s been cold here, but yeah, I guess a few degrees hotter makes the difference. From the preliminary taste of things, it tastes awesome. I hope it still does after fermentation. Kimchi bacterias, I hope you’re doing the right job!! P.S. 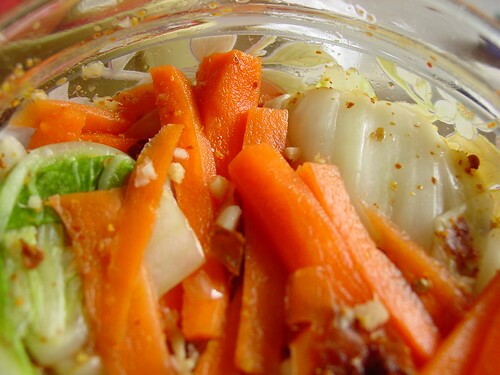 Just what is the bacteria involved in fermenting Kimchi! ?